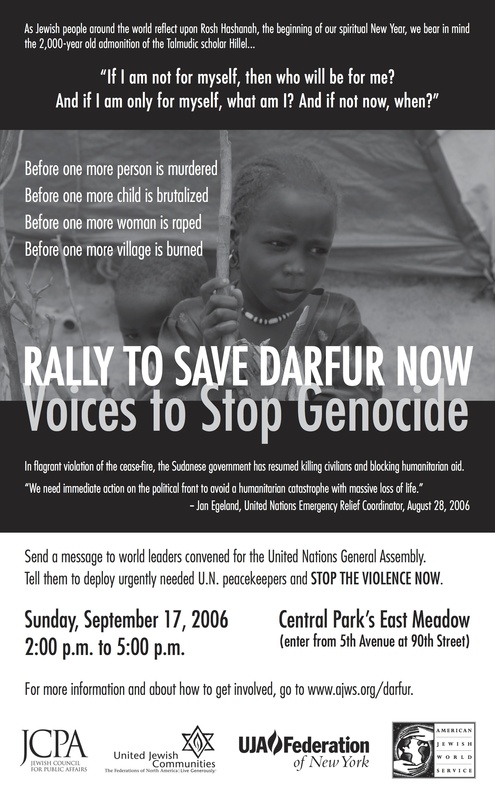 While Vice President helping manage the New York office of Fenton Communications, Progressive Source’s CEO Jonathan Greenberg managed the marketing campaign for the Save Darfur Rallies in Washington D.C. and in New York’s Central Park. On behalf of the American Jewish World Service, a founding Save Darfur Coalition member, Greenberg created and placed a major paid newspaper, radio and Web campaign to turn out tens of thousands of people. Greenberg also created a small “day of” the rally flyer and supervised a team of 15 workers who crossed the park publicizing the event. The New York rally drew more than 30,000 people and made the front page of The New York Times. The week after the Central Park rally, both President Bush and U.N. Secretary General Kofi Annan addressed the General Assembly, expressed their opposition to the genocide and demanded that U.N. peacekeepers be brought an to end it.